← UNITY heads to Vegas. Try your luck now. 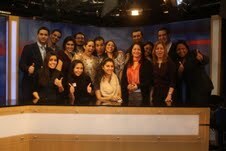 (Courtesy: José Antonio Acevedo) More than 2 dozen NAHJ D.C. members met at the Telemundo/ NBC NewsChannel/ CNBC Capitol Hill Bureau. Lori Montengo from Noticiero Telemundo hosted our meeting. Chris Peña from NBCLatino.com came in from New York City to talk about the new project. Thanks to all who attended the meeting at the Telemundo/NBC NewsChannel Capitol Hill Bureau. @NAHJDCLoving the Spanglish/Bilingual talk with @llmontenegro !